Custom 3d Teddy Bear cake birthday Cakes Long Island New York. This cake is a custom made teddy bear cake that was specially designed for one of our favorite customers. This cake was made to replicate a childhood teddy bear raccoon. You can see the real teddy bear in the left side of the picture above. The customer wanted to surprise her twin sister with a 3d teddy bear cake that had sentimental value and would bring back some childhood memories. The Teddy bear cake was professionally sculpted and piped with vanilla buttercream to resemble its fur. He is also accessorized with a diamond engagement ring and a fireman's hat bearing his name, Neno. This is a small sample of how we can create a custom teddy bear cake. We can make it as big or as small as you like and it can be filled with a variety of delicious cake fillings. 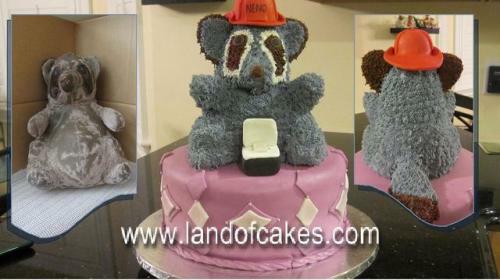 Land of cakes New York would love to create your next custom 3d Teddy bear cake.